Plants use osmosis to absorb water from the ground. During osmosis, fluid passes both into and out of the semipermeable membrane. Water intoxication may occur if someone drinks a large amount of water in a brief period of time. Osmosis is a process in which a fluid passes through a semipermeable membrane, moving from an area in which a solute such as salt is present in low concentrations to an area in which the solute is present in high concentrations. The end result of osmosis, barring external factors, will be equal amounts of fluid on either side of the barrier, creating a state which is known as “isotonic.” The fluid most commonly used in demonstrations of osmosis is water, and osmosis with a wide variety of fluid solutions is key for every living organism on Earth, from humans to plants. There are some key terms related to osmosis which may be helpful to know when thinking about how osmosis works. The fluid which passes through the membrane is known as a solvent, while the dissolved substance in the fluid is a solute. Together, the solvent and dissolved solute make up a solution. When a solution has low levels of a solute, it is considered to be hypotonic, while solutions with high solute levels are known as hypertonic. In a classic example of osmosis, plants use osmosis to absorb water and nutrients from the soil. 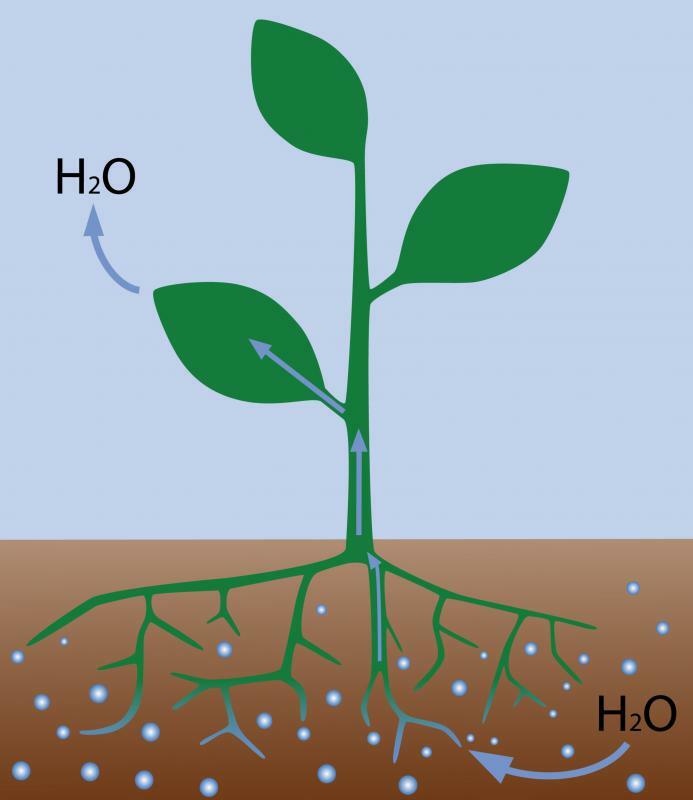 The solution in the roots of the plants is hypertonic, drawing in water from the surrounding hypotonic soil. Roots are designed as selectively permeable membranes, admitting not only water, but some useful solutes, such as minerals the plant needs for survival. Osmosis also plays a critical role in plant and animal cells, with fluids flowing in and out of the cell wall to bring in nutrients and carry out waste. Fluid passes both in and out of the semipermeable membrane in osmosis, but usually there is a net flow in one direction or another, depending on which side of the membrane has a higher concentration of solutes. It is possible to alter the process of osmosis by creating pressure in the hypertonic solution. When the pressure becomes so intense that the solvent from the hypotonic solution cannot pass through the membrane, it is known as osmotic pressure, and it will prevent the attainment of an isotonic state. The principles which underlie osmosis are key to understanding a wide variety of concepts. For example, the sometimes fatal medical condition known as water intoxication occurs when people drink a large amount of water very rapidly, causing a dilution of the water which flows freely through their bodies. This diluted solution is capable of pushing through the cell membranes, thanks to osmosis, and it can cause cells to explode as they expand to accommodate the water. Conversely, when people become dehydrated, cells shrivel and die as the free-flowing water in the body becomes highly concentrated with solutes, causing water to flow out of the cells in an attempt to reach an isotonic state. What Are the Differences between Diffusion and Osmosis? I don't get it. Doesn't a plant have a lower solute concentration than soil? So how is osmosis the movement of water molecules from low concentration to high concentration. Wouldn't it be high to low then? Thanks a lot for your help, can you tell me how I can cite it properly using APA format? Thanks! I never knew how water poisoning worked! I know, it is very helpful. Helps me with all my exams. @ Tdwb7476- Learning by osmosis is the premise behind language immersion. This technique of teaching language is similar to how children learn to speak. Repetition, hearing people use words in context, and seeing the actions that relate to words can be the difference in someone learning a second language and giving up. Before moving to the southwest, I lived about 45 miles from the Canadian border. I took French for four years throughout high school, and nothing helped me learn the language more than the numerous weekend trips to Montreal. Referring to the point in the article where the author talks about adding pressure to the hypertonic solution, applying enough pressure would create reverse osmosis. Reverse osmosis is one of the most effective ways to purify water. The process works by injecting dirty water through rolled membranes from the center out. The semi permeable membrane only lets particles the size of water molecules through; blocking ions, bacteria, and larger molecules like urea and sugars. The water treatment facility in Orange County, California is a testament to the capability of reverse osmosis. The plant uses reverse osmosis and a few other processes to turn raw sewage into purified drinking water for a half million California residents. from the sewage so all that is left is water with toxic solutes. Next, reverse osmosis filters the solutes from the water. In the third step, ultraviolet light kills any viral contaminants. Finally, plant workers treat the water with hydrogen peroxide to sterilize it. Some people talk about "learning by osmosis" which takes the principal of the real osmosis -- the water-related definition -- and applies it to learning. That is, one learns about something just by being around the knowledge. It's sometimes called sleep learning or subconscious learning.